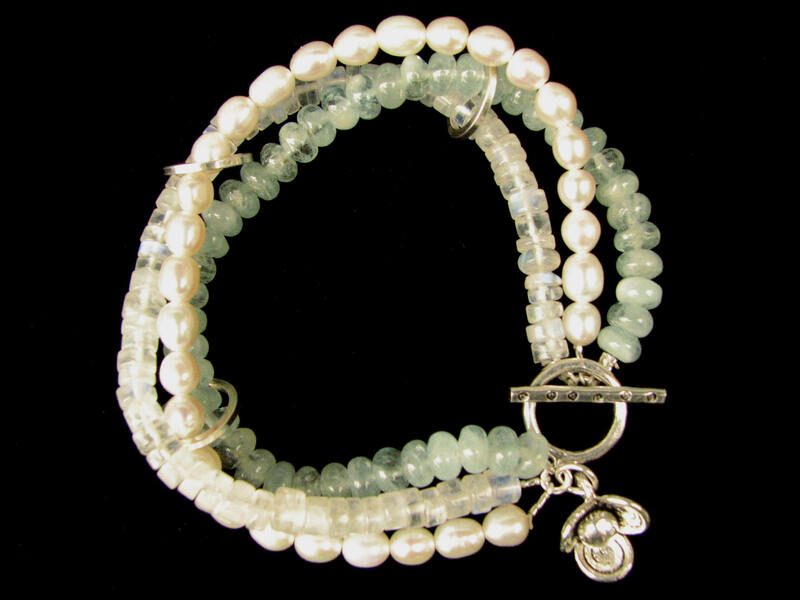 Our unique handmade bracelet inventory includes sterling silver & precious stone bracelets, unique beaded bracelets, silver cuff & lamp work bead bracelets, & anklets. Enjoy Shopping! This 7.5 inch BOLD HANDCRAFTED LEATHER AND COPPER BRACELET features a heavy rustic 1 5/8 inch wide leather band, nine domed copper discs secured by Chicago screws, and a three snap closure. 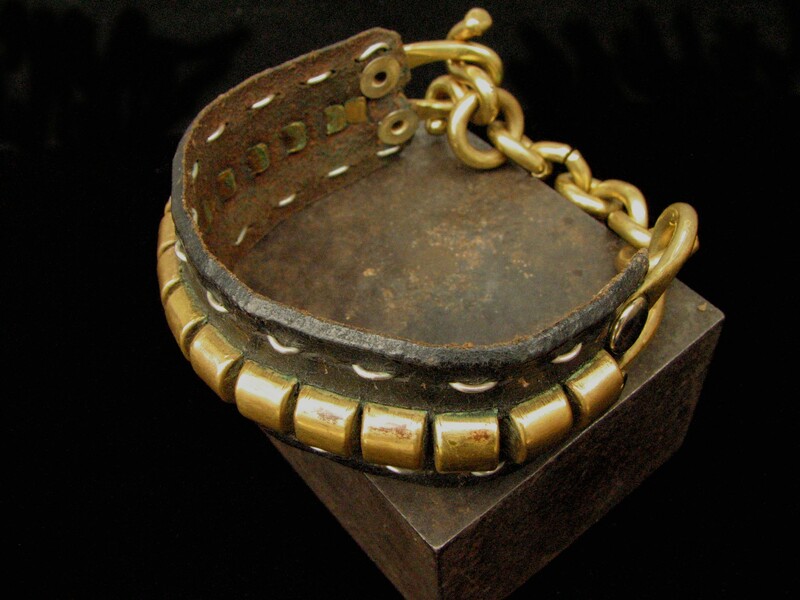 Made from a real horse bridle this BRONZE AND LEATHER BRACELET features a 1″ leather band with bronze trim down the middle and sterling wire stitching on each side. A large handcrafted bronze hook and eye is connected to the bracelet by large handcrafted bronze loops and chain. This 7″ bracelet is truly one of of kind. This fun Dog Tag Leather Bracelet features a German silver dog tag stamped with the word “DARE”. The bracelet is 3/4 inch wide apple green leather with a large magnetic clasp. Size is 6.5 inches. This fun Dog Tag Leather Bracelet features a German silver dog tag stamped with the word “ENJOY”. 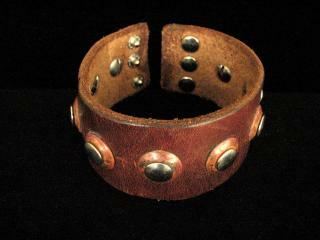 The bracelet is 3/4 inch wide orange leather with a large magnetic clasp. Size is 6.5 inches. 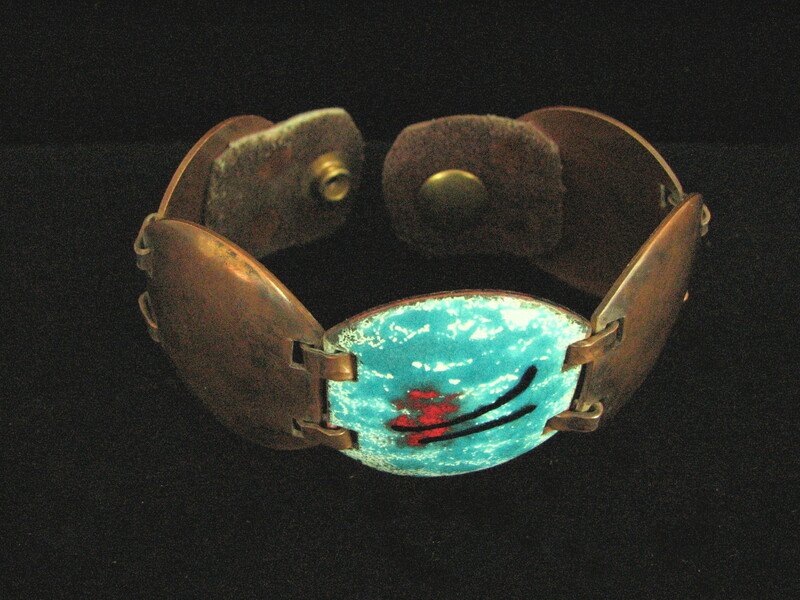 This unusual one-of-a-kind 7 inch DOMED ENAMELED COPPER BRACELET features four domed 1.5 inch oval copper plates with rustic patina and one with beautiful turquoise blue enamel. Each is joined with two handcrafted copper plate connectors. The handcrafted closure is leather riveted to copper with a brass snap. Rustic and beautiful at the same time! This rustic color accented Enameled Hammered Copper Hinged Bracelet features handcrafted copper squares each accented with different enameled colored centers. Each square is hinged with copper O-rings. The matching hook and eye clasp is also handcrafted. Size is 6 3/4 inches. This beautiful Gemstone and Sterling Silver Bracelet with Heart Charm is crafted in sterling silver and features 7 oval gemstones in a flexible chain link design. The gemstones are amethyst, citrine, peridot, and garnet. The box clasp is sterling with an amethyst gemstone. The charm is a sterling silver puffed heart. Size is 7 inches. This beautiful Gemstone and Sterling Silver Tennis Bracelet is crafted in sterling silver and features 14 oval and 14 round accent gemstones in a flexible single line design. The gemstones are amethyst, quartz, emerald, citrine, garnet, topaz, and sapphire. The toggle clasp is sterling. Size is 7 inches. This handcrafted Hammered Copper Charm Bracelet features oxidized copper discs each with a different imprint. Also included is a delicate cluster of small copper heart charms. Size is 6.5 inches. This handcrafted Hammered Copper Disc Bracelet features oxidized hammered discs linked with copper O-rings and a matching hook and eye clasp. Size is 6.5 inches.